I ♥ Motherhood: Do You Have Baby Lag? Well it's official. I do. 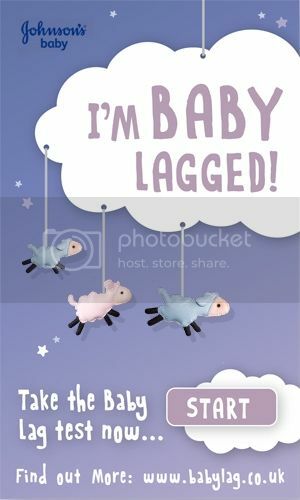 I am 87% Baby Lagged according to the JOHNSON'S Baby site. I'm sleep deprived but striving. I would say that's pretty accurate actually. Noah is 16 months old and we've only just started to get a few unbroken nights sleep. It's never guaranteed but the ratio is approximately 5 nights bad sleep to 2 nights good sleep! Now I've typed that out it doesn't feel much to celebrate actually. Baby Lag is mainly associated with new parents, who have a baby not sleeping, but I can say that as parents of two children (I have to mention Isla is a great sleeper!) we definitely have that 'zombie feeling' during the day and we also crave uninterrupted deep sleep. It's been a hard thing to accept having a bad sleeper when we were so spoilt first time around with a child who sleeps like a dream and who will sleep through 12 hours a night. Keep a sleep diary so you can track progress - when you're tired you'll lose track of 'good' nights and 'bad' nights - note it down and then you can truly see if your baby is getting better at sleeping! And finally if you can catch up on some sleep in the daytime. Easier said than done I know - that washing basket will be calling out to you, or the hoover will be glaring at you to run it round but actually as a parent you'll do yourself more favours if you catch up on the zzzz's. Baby Lag can threaten to spoil your enjoyment of your little one. You can test whether you are Baby Lagged by clicking on the badge below. It'll take through to the JOHNSON'S Baby site where you can play 3 fun games to help determine how 'Baby-Lagged' you are, based on reaction times, coordination and memory, once you've received your score you will be introduced to a 3 step bedtime routine - I do hope you're less than 87%! This is a sponsored post, but the advice from JOHNSON'S Baby could stop you looking like the cast of Shaun of the Dead! I also have work/life/motherhood/wife lag. Shall we all whoosh away to a desert island and drink cold beer? I'll second all those lags. i think I need to get 'on the lag'! how about an after Christmas London Piano Bar jaunt?? yes SAM I think we should whoosh away somewhere! Somewhere I can rejuvenate and feel young again! !